Theresa & her Husband Steve Joers relocated to St. George in 2005. Before becoming a Realtor ,Theresa worked 30 years for a major telecommunications company in Wisconsin. Theresa has been a Realtor for 15 years . Theresa has helped numerous clients relocate to Southern Utah. 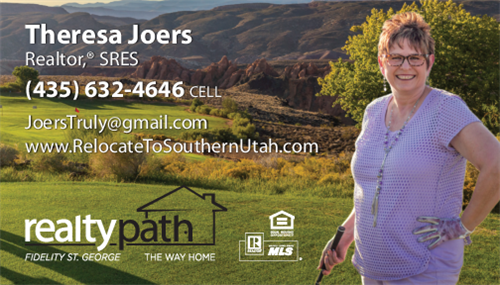 She has have been blessed with awesome clients and appreciate the many referrals she recieves.. Outside of Real Estate sh is associated with The Assistance League of Southern Utah and works with Animal Rescue Groups. Affiliated with Realtypath- Fidelity St George, and can be reached at 435-632-4646. Email: joerstruly@gmail.com. www.RelocateToSouthernUtah.com.